Yellowstone Bison grazing on the Fort Peck Reservation in southeastern Montana. Photo by Alexis Bonogofsky, NWF Staff. Two decades of work to restore wild bison across landscapes they once dominated continues to pay off. The latest good news is that Fort Peck in northeast Montana is getting more Yellowstone bison. 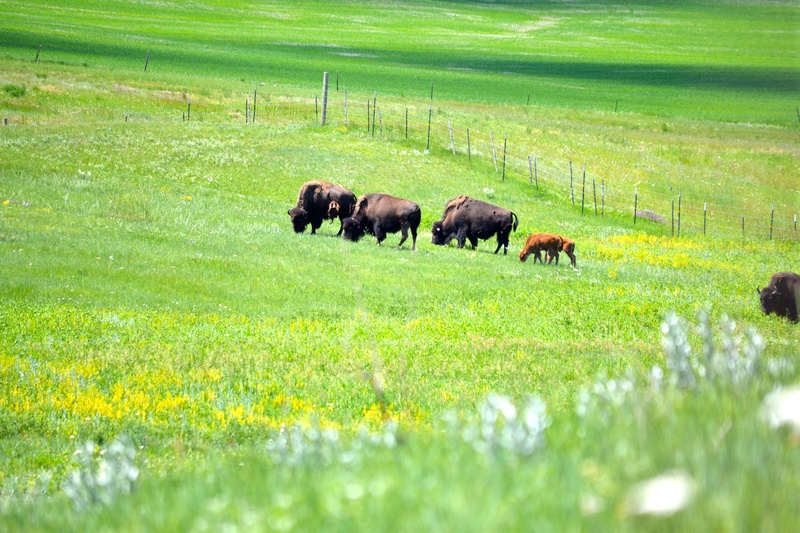 The state Fish and Wildlife Commission has decided to transfer 146 bison from Ted Turner’s Montana ranch to the reservation. The animals will join the 50-some already at home on the rolling prairies on Fort Peck land. The commission’s decision to send all the bison to Fort Peck instead of three or four separate locations follows the transfer of 64 genetically pure bison from Yellowstone National Park in 2012. Last year, Fort Peck shipped 34 of the animals to the Fort Belknap reservation, also in northeast Montana. The bison that will be relocated from Turner’s ranch were originally intended for the Wind River tribes, which have renewed efforts to return wild bison to their lands. A major milestone in the campaign to return this iconic species to its historic range was the recent approval of the Northern Tribes Buffalo Treaty, signed by 10 tribes in the U.S. and Canada to the 6.3 million acres of grasslands under their collective control. The National Wildlife Federation, one of the signatories, has worked with the tribes and other conservation groups for more than 12 years to bring wild bison home. Two centuries ago, more than 30 million bison streamed across North America. The massive herds fundamentally shaped the prairie ecosystems as well as indigenous people’s lifestyles, culture and spirituality. Since bison were slaughtered en masse in the 19th Century, their absence has been felt in the ecosystem and Native American culture. Yellowstone bison are special to the tribes because they are the last wild, genetically pure free-ranging herd. For years, the tribes, NWF and other advocates have urged that bison wandering out of Yellowstone be transferred to tribal and federal lands rather than be gunned down out of fear they’ll spread disease to livestock. Some of the bison carry brucellosis, which can cause pregnant animals to abort. There have been no confirmed cases of bison transmitting brucellosis to cattle, but to be safe and to ease fears, the bison were tested and held for five years in a quarantine facility outside Yellowstone before they were transferred to Turner. The bison on Turner’s ranch and on the reservations, all brucellosis-free, continue to be tested. At Fort Peck, the Assiniboine and Sioux tribes have set aside 25,000 acres for Yellowstone bison. Special fencing has been installed. The first shipment of bison was greeted by songs, ceremonies and excitement for days. Since then, the reception has been more quiet — but even more profound. Robbie Magnan, manager of the Fort Peck Tribes Game and Fish Department, has said the bison’s return has helped restore balance to the land. Tribal members have witnessed the return of songbirds. Native grasses and wildflowers are thriving. Last year, Magnan told Alexis Bonogofsky, NWF’s tribal lands manager, that he has seen pronghorn following the bison in the winter. Bison use their massive heads to push through the snow, clearing the way to forage that pronghorn and other wildlife can eat during the harsh winters. “These last two years have been exciting. After years of hard work and commitment, we’ve seen so much progress. On the surface, it seems quick, but it’s been a long time coming. The tribes have been waiting about 150 years,” Voggesser said.